I have around 1,000 pages of “swipe” which is a direct response copywriter’s term for copy that’s already been published – online or mail. Most of my colleagues have a swipe file. Some swipe files are more organized than others. I also have a book of winning headlines plus manuals with excellent examples of direct response copy … even more swipe. 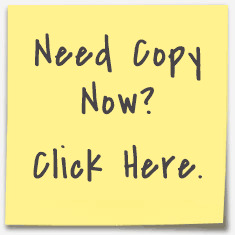 Outright copying of copy is, of course, illegal; it violates copyright laws. However, it’s almost always acceptable to use swipe for inspiration and ideas. Ultimately, as a direct response copywriter, you have to follow the usual formats or you just won’t sell anything. I use headline templates … 99% of copywriters use the same templates. The other day, I read a golf promotion which was total swipe. It combined the ultra-famous “They Laughed When I Sat Down to Play the Piano” headline with a John Carlton golf headline. Carlton wrote the most outlandish golf copy I’ve ever seen. Here’s an example of a Carlton headline. Quite frankly, I would never write a golf headline so outlandishly false. Golfers are intelligent and they know they’re not going to hit a 3-wood 230 from their knees. So the headline I read, which I won’t fully reveal to protect the innocent, was an exercise is swipery. Swiping is NOT copywriting. The job of a direct response copywriter is to get into the soul of the potential reader and discover what they really want … then present the product or service that satiates their need or want. The presentation must be believable. In my experience with extensive testing, simply swiping away does not beat controls. I will always defer to testing results but swiping famous headlines rarely works. Look – I understand the technical elements of direct response copywriting. And this requires using tried and tested headline formats and templates. And I understand using one of the 10 or so direct response formats. But simply bolting two classic headlines together and then offering a promise the product cannot keep is not copywriting. It’s slack and shoddy and unlikely to persuade anyone except really stupid people who will believe anything.